Sometimes the joy in my work comes from successfully finding a solution when I’m staging a difficult room. Of course “difficult” is subjective. But when you’re preparing your home to sell, you don’t want to leave anything to chance, allowing unresolved problems to stir in your potential buyer’s mind and become a deterrent. Instead, address the challenge head on in advance. 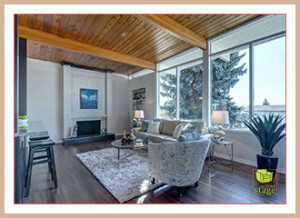 This Killarney Calgary property we staged offered multiple challenges. Most notably, it turned out that the built-in headboard niche in the master bedroom was too small to fit a queen bed AND two bedside tables. Plus, I knew that the room was big enough to more appropriately fit a king size bed, which would also create a sense of added value to meet the desires of what potential buyers would be looking for in that neighbourhood. So this became a perfect example of how important it is to think outside the box (or, in this case, niche) when staging a difficult room to sell. After lots of creative brainstorming, it was the C table that solved this problem. It’s not what would come to mind first when you think of bedside tables, but it was the perfect solution for this difficult room. We chose chrome and glass tables to add some glamour to the bedroom which felt like a natural fit for the feeling we were trying to create. 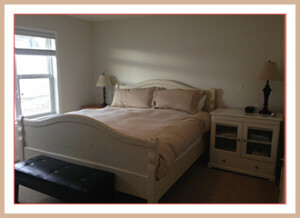 To finish it off, we placed a large piece of artwork across from the bed to balance out the size of the headboard. Colours from the artwork wereechoed in our choices of side chair and accessories. It became a cohesive space that made sense and therefore flowed. 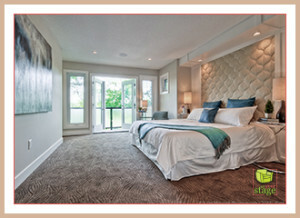 After, when the potential buyers walked in the master bedroom, they would notice how bright, spacious, and luxurious it was as they were drawn to the unique private balcony. They would not get distracted by trying to figure out what to do with that niche. 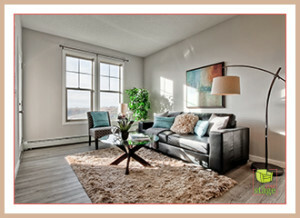 For more examples of the power and impact of staging, take a look at the Set Your Stage Facebook albums featuring many before and after photos of the various homes and condos that we’ve successfully staged to sell. 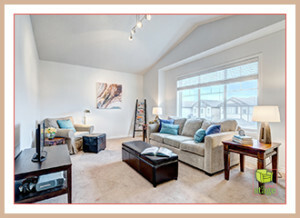 Let our experienced team stage your difficult room for potential buyers in your Calgary neighbourhood! An accent chair with personality is one of my favourite living room staging furniture pieces. If you’re listing a vacant property, it’s a no-brainer that staging furniture rental should include a great accent chair. 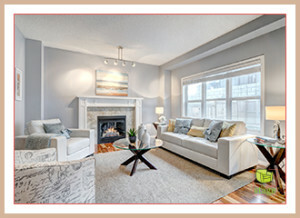 But renting an accent chair for staging can also be a great way to create impact in a furnished listing. Keeping walls and larger furniture pieces fairly neutral and unobtrusive works well in staging. But you don’t want your staged listing to be void of any personality. The accent chair is a perfect way to add a pop of colour, pattern, and personality which can be further reinforced through staging accessories. After: Brightly coloured art overtop of this fireplace really pops and adds to the space. Accent chairs can help to visually separate a larger, open concept space by creating a barrier which also serves to direct traffic flow (and show more seating area without making the room feel small). It’s a great way to create an experience for the potential buyer as they walk through the space. 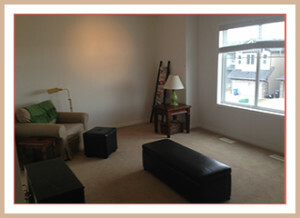 After: We love using lamps that really add to the look of the décor in this living room. It may be unconscious, but when you see a chair facing in a certain direction, you are drawn to look in that direction. Maybe it’s curiosity. Use an accent chair to encourage potential buyers to notice the focal point you are highlighting if they were to sit in that chair. An accent chair can be a great tool in living room staging and is a perfect choice for your next staging furniture rental. Give one a try. 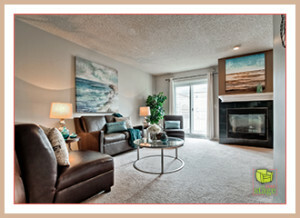 For more inspiration and home staging tips, take a look at Set Your Stage on Pinterest. Your house is officially ready for sale. 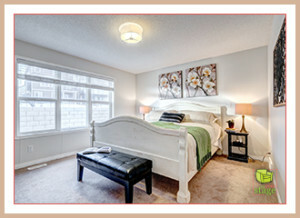 It has been professionally staged to make the best possible first impression. Real estate photos have been taken. Now the viewings have started. How do you keep your listing presentable? Here are my tips for sellers who are living in a staged home. Selling a house can be stressful. Professional staging can help it sell faster, but it can still feel too long for sellers who continue to live in their home while it’s listed. Especially for sellers who have kids, keeping your home like the stager intended can be quite a challenge. So what do you do when your realtor calls for a short notice showing when you’re living in a staged home? Don’t panic. Be prepared. Kitchen: In the short term, consider changing your eating habits to avoid cooking anything that creates odours. 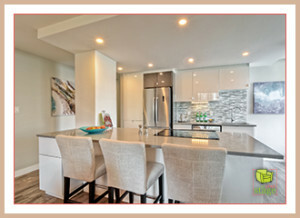 Sure, you can try to eliminate the odours, but it’s simpler to avoid creating them in the first place, especially if you have an open concept space. Bathroom: In your daily life, you love your own private bathroom. But for your own sanity in keeping the bathrooms clean, tidy and moisture free for viewings, consider sharing one main bathroom for use by everyone while your home is listed. Bedroom: You’ve gotta make those beds, put away clothes, and clear off the night stands. Consider designating extra bedrooms “off limits” while your house is for sale. You can even encourage kids to “camp out” together in one room in the short-term to reduce the last minute scramble. Bins, cabinets and containers: Make these your best friends while selling. 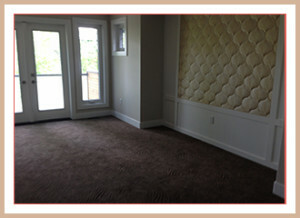 You will have already de-cluttered, donated, and perhaps sent some items to storage in the process of staging to sell. But for those everyday items like toys, shoes, important papers, etc., have a system in place to quickly hide them away. 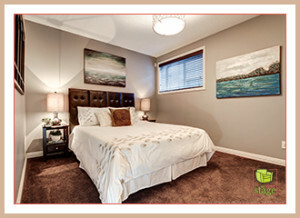 After: Hanging art above the bed brings the eyes of the potential buyer to the focal point of the room. Living in a staged home for sale is not the most convenient lifestyle choice. That said, it is possible to ease the stress with preparation while you keep your listing show-worthy. 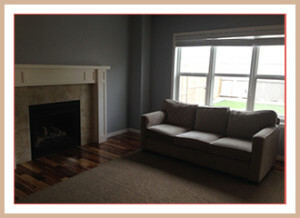 After: The upstairs living room looks like the perfect place to settle down with a good book! You are currently browsing the Set Your Stage weblog archives for May, 2016.